Isco was also on the mark as Real Madrid eased to a 2-0 win over Celta Vigo. Bale was on the scoresheet on Saturday afternoon. 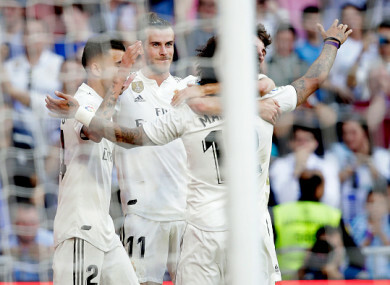 But it fell to Isco to break the deadlock after the hour and Bale made sure 13 minutes from time, moving Madrid two points behind city rivals Atletico in second ahead of their trip to Athletic Bilbao later on Saturday. Navas, preferred to Thibaut Courtois in goal, made a stunning reaction save from Gomez’s 16th-minute header and Celta retained a threat on the counter-attack throughout. The Wales forward crossed for Karim Benzema to roll into the net during first-half stoppage time but was correctly penalised for crashing an elbow into Kevin Vazquez’s face and fortunate to only see a yellow card. Unperturbed, Bale went sliding into Sofiane Boufal in the 53rd minute, the act of turning his studs to the turf before contact enough to spare him. Modric thought he had given Madrid the lead when he drove home from Toni Kroos’ partially cleared corner, only for a Raphael Varane to be ruled offside and interfering by a VAR review. The breakthrough came after 61 minutes as Madrid constructed the type of sharp break that became a hallmark of Zidane’s initial reign and Isco slid home Benzema’s low cross before departing to a standing ovation. Email “Bale on target as Zidane's second coming starts with victory ”. Feedback on “Bale on target as Zidane's second coming starts with victory ”.